Mark joined the Lonestar Soccer Club in its inaugural season in 2004. 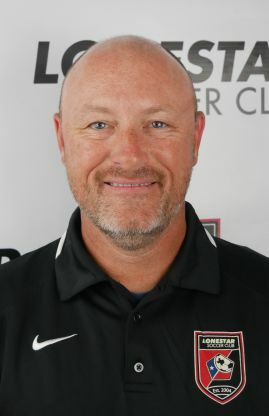 Prior to joining Lonestar SC, Mark coached with the Round Rock Crossfire and their Academy program. Mark has coached his teams to several Western District and State Championships and is also active in the Lonestar Academy Program. As a youth, Mark played with the Arlington Lonestar Soccer Club ’70 and the Dallas Longhorns ’70 in the North Dallas Chamber of Commerce Classic Soccer League.He spent his collegiate career as an Austin College Kangaroo, in Sherman, TX where he was selected to the TIAA All-Conference team.